Christmas; the festival is approaching us soon. Time is moving fast and the holiday will be here even before you know about it. In such a case if you are looking for a quick and easy to make gift ideas for your near and dear ones then we are here to cover you up and save time and money. We all are big fans of those things which are made at home. From cleaning supplies to food to home décor and everything which comes in between. Christmas is truly the most exciting time of the year for one and all, especially for those who love cold weather and enjoy making homemade ornaments, gifts, Christmas tree and desserts. Today we will be sharing with you some cinnamon ornament with card board ideas which is one of the great ways to use up your cinnamon sticks which you had shoved in the back of your spice cupboard and create some stylish craft. Cinnamon is a spice which is obtained from the inner bark of various trees and is mainly used as an aromatic condiment in a lot of cuisines, sweet dishes, snack foods and tea. The aroma flavor and of cinnamon is derived from its essential oil. The term Cinnamon is also used to describe the mid brown color. Cinnamon is also a name for various species of trees. Cinnamomum Verum is considered as a true cinnamon. 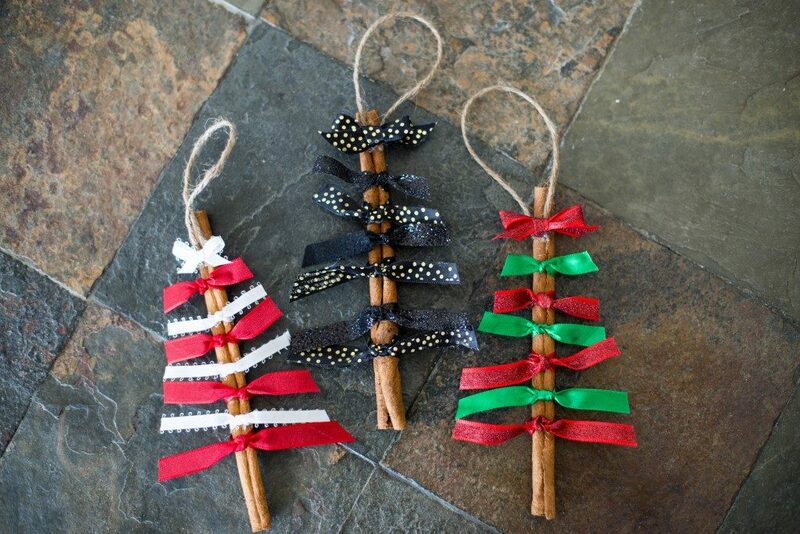 Homemade Cinnamon Stick Ornaments are not only easy to make but it also gives a beautiful, artistic, aromatic and charming look wherever it is decorated. Cinnamon not only smells good but tastes even better. The DIY project which includes cinnamon is simple for kids too. Cinnamon sticks decoration ideas are a wonderful option for Christmas tree decoration and also for creating fragrant festive table centerpieces. Christmas wreaths and window decorations, a fireplace and wall decoration gets an enhanced spirit of the winter holiday with DIY cinnamon garlands. Some ornaments are made using ground cinnamon while others are made using whole cinnamon sticks. Once you understand the basics, you will get endless possibilities. No matter what method or procedure you opt, the tree and the room will be filled up with aromatic fragrance. Here we bring you the collection of charming, fragrant and simple Christmas decorating ideas to inspire green festive décor which adorns the wreaths and candles centerpieces to make them look creative and festive. The gold and black ornament will definitely become the center of attraction once it is displayed. Twine for the Hanger Loop. Depending on the height of your Cinnamon stick, simply tie 5 to 6 pieces of ribbons around 2 cinnamon sticks. Once tied, lightly spray the ribbons with spray starch and iron it on low temperature to make sure it becomes stiff and stands out perfectly. If there is any plastic or rubber embellishments on the ribbon then make sure it doesn’t melts. Starting from the end which you want to be at top, cut down towards the bottom of the tree at a diagonal with scissors which will make the ribbon longer at the bottom. As per your desire, cut the length of the twine for hanger and with the help of glue, stick the ends of the twine to the cinnamon stick. As per your desire, tie a small bow with your favorite color ribbon and glue over the bottom of the twine pieces to cover. Hang your tree once the glue dries. For this simple DIY project you will need: 3” Cinnamon Sticks, Assorted Buttons, Glue Gun, Wire Cutters, Hemp Cord or Twine, Ruler and ¾” Canadian Pine Garland. Once you have gathered all the materials, plug in the glue gun first to make it warm. Meanwhile, cut 7” pieces of twine and 1”, 2” and 2 ½” pieces of Canadian Pine Garland with the help of your wire cutter in different sizes as per the number of ornaments you wish to make. Once you have the pieces, start assembling them, step by step. First, glue the pine to the cinnamon stick by placing the shortest 1” piece at the top and both others follow. Once done, glue the twine at the back of cinnamon stick. 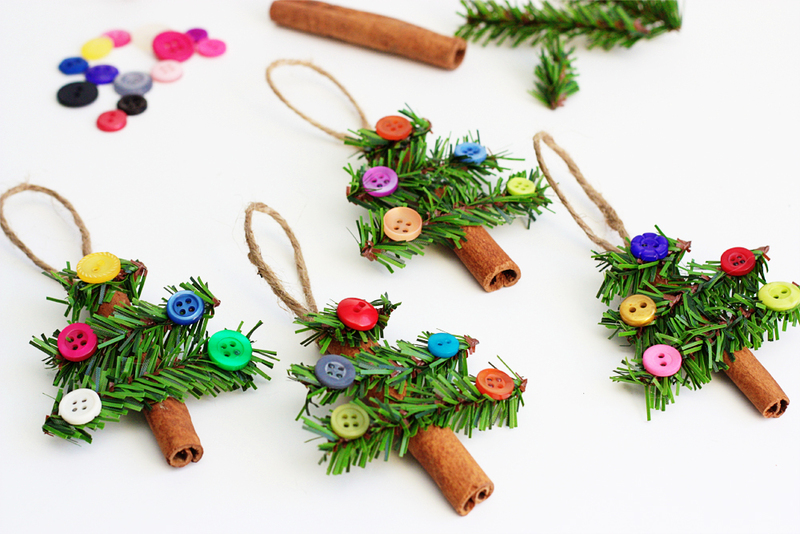 Once done, start decorating the tree with buttons. You can place them at the top and on each side of the branches, though there are endless ways and possibilities to decorate your ornament by using sequins, pom pom and glitters. For this ornament idea, you will need: About 25 Cinnamon Sticks, Cardboard, Pencil, Scissors, Hot Glue Gun and Glue Sticks, Ribbon and Mason Jar Lid. Trace with a mason jar both the inside and the outside of the circle to form a wreath like shape on a card board. Once traced, cut it out. Do not hurry up while cutting it or else your circle won’t come out in a perfect shape. 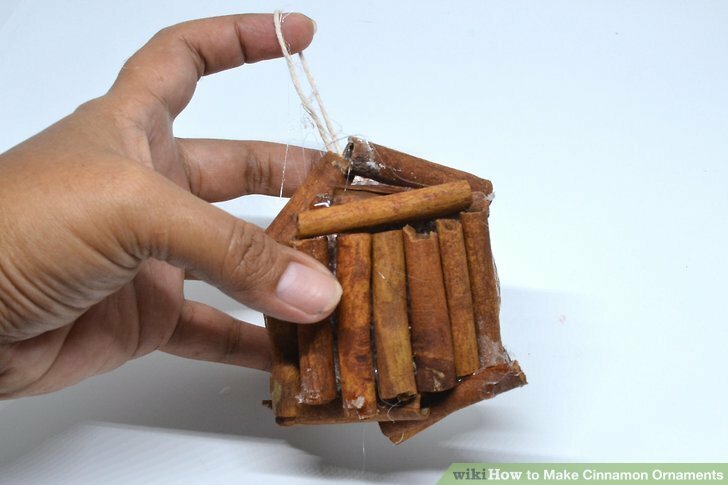 Take cinnamon sticks and hot glue it around the circle. Use thick sticks as the base layer. Once you are done with the first layer, fill the gaps with skinny cinnamon sticks. You can use as many sticks as you want to get your desired look. Tie a ribbon around the sticks and it is done. 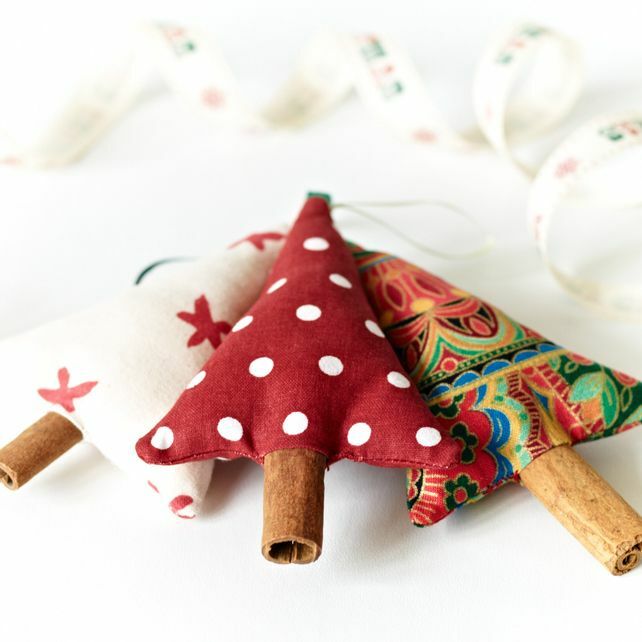 You can also stick it to your Christmas tree to spread the fragrance of cinnamon around the living room. 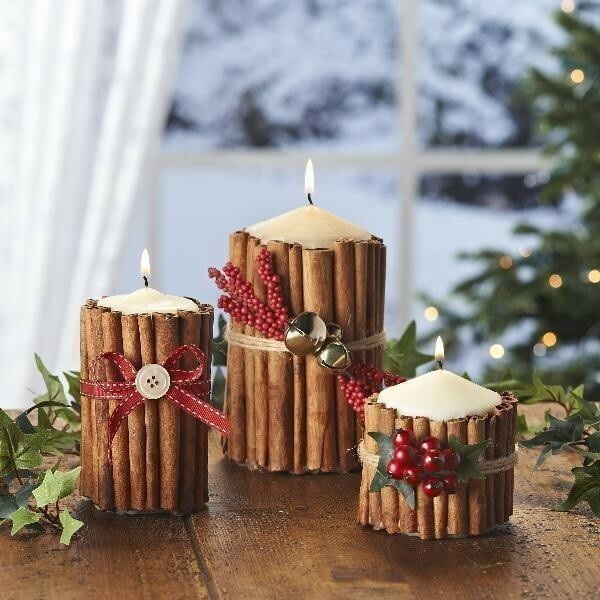 Cinnamon sticks have a unique texture and aroma which brings a pleasant brown color into holiday home décor. Handmade decoration of cinnamon sticks with pine cones, nuts, dry fruits, cranberries, felt fabric, natural rope, straw and twines will give it a rustic look in cold winter. Native to Southern India and Sri Lanka, cinnamon comes from small evergreen tree and therefore handmade decorations with cinnamon sticks brings in an exotic flavor in Green holiday décor which is enough to delight and surprise everyone with an aromatic fragrance. 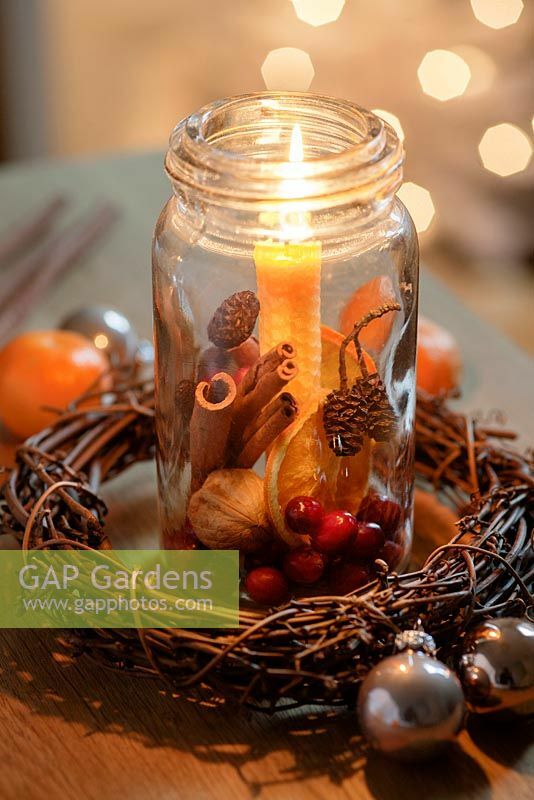 The spice gives a strong flavor to Christmas decoration and enhances the table décor with a famous festive scent. Collect some cinnamon stick of about 3” each and place them in a mirror jar and keep the lid open. Tie a bunch of cranberries around the jar and display it on the dining table. In this decoration idea, you need to first cover a card board with white sheet and then glue the cinnamon sticks on the sides of the board. Once done, glue some cinnamon sticks in the shape of a Christmas tree in the center of the frame and decorate it with a silver star at top. You can also decorate your name on top of the board with cinnamon sticks. 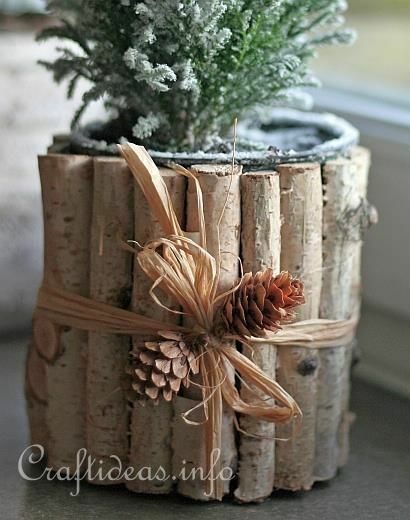 in this decoration idea, all you need to do is collect few thick cinnamon sticks and glue them together. Once done, simply store the flowers in it and keep it on the dining table or a center table for spreading some beautiful aroma. There can nothing be better than 2 different fragrances coming together and spreading a sweet aroma all around. All you need to do is collect few cinnamon sticks and stick it to a scented candle with the help of a rope. Once done, display it on a table or a shelf on a plate and let the aroma spread all around your living room. You can also use this romantic aroma in your bed room. It is a Christmas time after all and how can we forget our beloved Santa who spreads the fragrance and smile of joy and love all around? In this decoration idea you can tie few sticks together with a fabric ribbon and with the help of red color design Santa’s hat and with black color decorate the eyes and use white mayonnaise to design the beard and you are done. 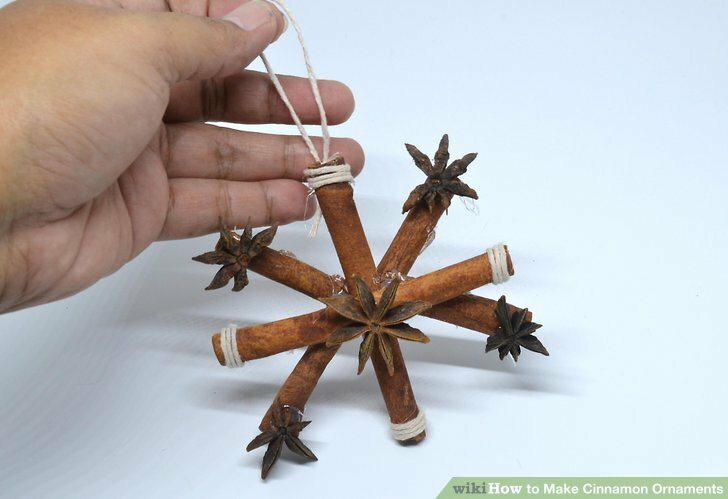 Cinnamon Star Ornament: The décor idea is simple and easy even for kids to make. 5 Cinnamon Sticks per Star. Any Embellishments of your preference, though silver bells would look wonderful. Dab some glue on the corners of cinnamon sticks after placing them in the shape of a star and leave it to dry. Loop some ribbons or twine through the top of the star, add some silver bells and other embellishments of your choice, tie a knot and bow and hang it on the Christmas tree and you are done. 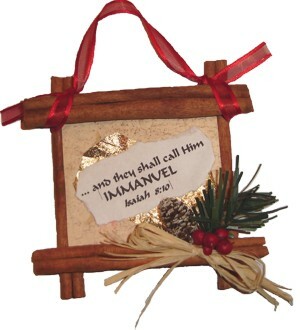 Not only the kids but adults too in the house will love in making this ornament. For this ornament you will need: ¾ Cup of Apple Sauce, 2 TBSP and 1 Cup of Ground Cinnamon and 2 TBSP of White Glue. 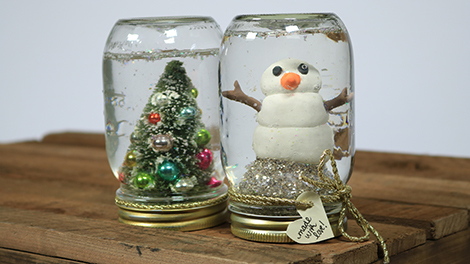 Start off by deciding whether you want to bake your ornament or air – dry them. Air dry takes few hours where as baking will only take 2 hours 30 minutes. If you plan to bake then start off by pre – heating your oven to 200 degrees F.
With the help of a spatula, mix apple sauce and cinnamon in a bowl and keep stirring until it forms a ball of stiff dough. It is recommended to go for smooth apple sauce rather than chunky one. Pulse your apple sauce in a blender if it has large chunks or else your ornament will get lumpy. Add 2 TBSP of white glue in the mixture to make the ornament last longer. Roll your dough until it gets 6.4 to 8.5 mm thick, once done take 1/4th dough and roll it on a wax paper’s sheet. Dust it with extra cinnamon to avoid sticking. Try working with smaller batches of dough rather than one big batch. With the help of a cookie cutter, cut your dough in different shapes. Trees, Ginger bread Men and Stars are popular though. Once you are done with the cutting of first batch, roll out another batch and cut more. Using a straw or a skewer, poke a hole on top of each ornament which should be big enough to let a piece of ribbon or string to pass through it. Now place your ornaments on a baking sheet and bake it for 2 hours 30 minutes. If you do not wish to bake then keep it for at least 2 days to air dry naturally but make sure to flip each ornament every six hours so that they dry perfectly. Once done, decorate the ornament with glitters or paint. If you want them to look like real ginger bread cookies then decorate them with white paint which will look like an icing. When decoration is done, set aside again to dry. Lastly, through the hole, thread a ribbon and tie into a secure knot but make sure the loop is big enough to fit over the branches of the tree. To make a dough ornament, preheat your oven to 350 degrees F. If you do not want to bake then you can air – dry it which will take around 24 hours where as baking will not take more than 10 minutes. Mix your flour with cinnamon, add salt and water gradually. Combine the dry ingredients first and once they are evenly mixed, slowly add warm water to it. Keep kneading until desired consistency of dough is achieved. Take 1/4th of dough and roll it on wax paper. Dust some extra cinnamon to avoid it from sticking and work in small batches. With a cookie cutter, cut the dough in different shapes and poke a hole large enough on top of each shape so that a ribbon can be passed through it. Shift your ornaments to a baking sheet and bake them for 10 minutes. If you want to air – dry then keep it aside for 24 hours and flip them every 6 hours so that it dries properly. Once baked or air – dried and cooled, start painting them by drawing shapes and designs on them with glitter and glue. For a rustic ginger bread look, use white puffy paint which will look as same as icing. When done, keep them aside again to dry. Now, finally, thread a piece of ribbon through the hole and secure it with a tight knot. For this décor idea, paint a small Styrofoam ball using a brown acrylic paint and try to match the color of the cinnamon sticks which will be helpful in hiding the Styrofoam when the decoration is over. It is recommended to not use a spray paint. Cut your cinnamon sticks in 2 inches long pieces and with a sand paper smooth away the jagged edges. Number of cinnamon sticks needed depends on the size of the Styrofoam ball. Tie a string piece in the loop then glue the knot to the top of the ball. Make sure the loop is big enough to fit the branch of your tree. With hot glue on one end of cinnamon stick, press it against the ball and hold until the glue sets. Glue another stick next to it. Keep fixing the cinnamon sticks until you are barely able to see the ball. It will end up like a spiky ball made of cinnamon. 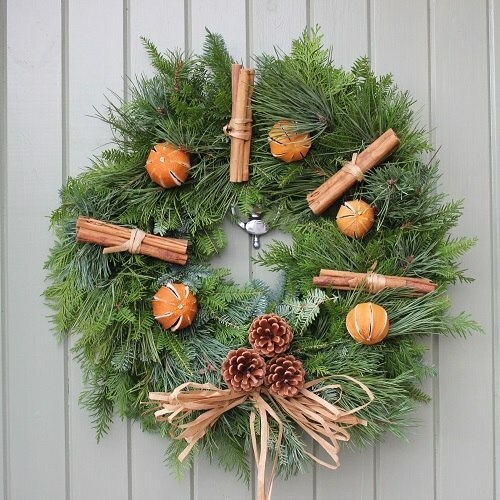 Once done, hang the ball on the tree or you can also hang it from a fire place mantel, window or a door knob. Here comes an end to our most trending list. Try them out but do not forget to experiment because there are endless possibilities and your own creative levels are much higher than you think. You can quickly change the handmade decorations with little details and use it for the New Year’s party decoration too.